That night, the second cat sat on my chest, purring, and I wondered how I could love her if she’d eaten someone else I loved. I mean, it’s a bit of a conundrum. It’s not as if the cat meant to hurt me or hurt the fish. The boys wanted a new fish, so we picked up a blue and red betta who eventually picked up the name Señor Pez. That was about two weeks ago. Señor Pez enjoys his home and loves exploring all the little nooks and caves made by the rocks. Last Sunday, I cleaned the tank, and when I took out the decorative lake snail shell, I found Bubbles. I can’t describe what happened. I won’t. I think I exclaimed, “Oh, God, Bubbles!” and Kiddo3 came running up to me, but I didn’t want him to see. I had to clean Bubbles out of the tank. I pulled out the stupid snail shell where he’d trapped himself and drowned, and I gave it a burial in the front yard in the same spot where we buried our first unfortunate shrimp. For two days, whenever I closed my eyes, I could see that moment when I found Bubbles. And by the next morning, the remaining two shrimp had cleaned the rest of the tank. How can you love someone who ate someone else you love? Señor Pez is looking a little ragged-ended now. I’m treating him in case it’s fin rot, but I’m surprised by how attached I am to these silly fish. And Bubbles. I miss Bubbles. I feel so bad about what happened to him, and that I didn’t even know. *hug* So sorry about Bubbles. 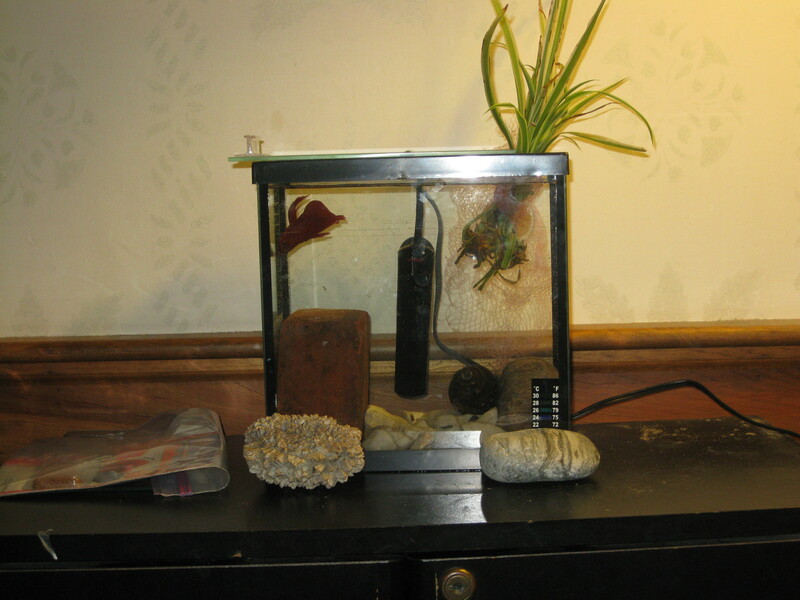 I hope Senor Pez has a long happy fishy life in your home. I’m sorry about poor Bubbles, and that you had to find him that way. We expect a certain level of violence in “real nature,” but when it appears inside our homes and our lives, where we think we are safe and in control… it’s distressing. I hope Senor Pez will be flourishing and sending up his own happy bubbles soon!